Over two years after his first aerial flight, Nolan departed Sydney in 1949 on a journey to Central Australia. Experiencing the rugged, desert landscape from the air presented him with a new spatial challenge. He broke with traditional perspectives and began to paint the flat landscape vertically up the composition board, moving toward the idea of an infinite landscape. 'Aerial landscape' emanates from this period and was included in Nolan's pivotal exhibition of Central Australian landscapes held at David Jones' art gallery in 1950. In contrast to other works included in the show such as 'Central Australia' (1950), there is no horizon visible in 'Aerial landscape'. 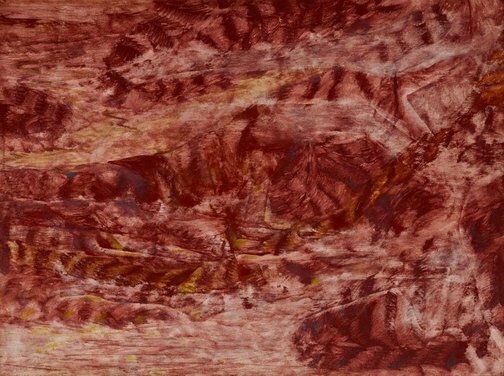 Indeed the comparison between 'Central Australia' 1950 (AGNSW) and 'Aerial landscape' is a particularly fruitful one: with the former painting revealing the artist's continued investment in topographical realities and the space of naturalism; and the latter, in contrast, presenting as both a section of inland terrain and a symbolic landscape design. The red earth of 'Aerial landscape' consumes the composition board and shifting patterns upon its surface acutely elaborate Nolan's notions of the abstracted landscape. Space remains undefined and distance ambiguous. The viewer's eye moves ceaselessly around the composition. This painting exemplifies Nolan's perception of the vast and all-encompassing nature of Central Australia, and indeed, his interest in amplifying such visions or responses into the terrain of the symbolic and the national. Nolan re-envisions the Australian landscape in ways which are not only of profound significance to subsequent imaginings of the Australian interior but which also establish close links with the aerial landscape designs of Margaret Preston in the early 1940s. Each marks a significant development in the history of Australian landscape painting. Signed and dated l.r., pencil? "noLAn/ 3-12-49". Sidney Nolan: desert & drought , Melbourne, 2003, 24. NOTE: this publication contains information generally relevant to the work (it does not feature the work specifically). Page 24 discusses the 1950 exhibition at David Jones' Art Gallery, which included this work.